Ballet is a highly visual guide to ballet history that captures famous dancers and key stories. It takes an inside look at more than 70 of the most famous performances like The Nutcracker and Swan Lake, shares stories of the most renowned ballerinas like Margot Fonteyn and Carlos Acosta, and much more! It’s enough to make any stage performer swoon. 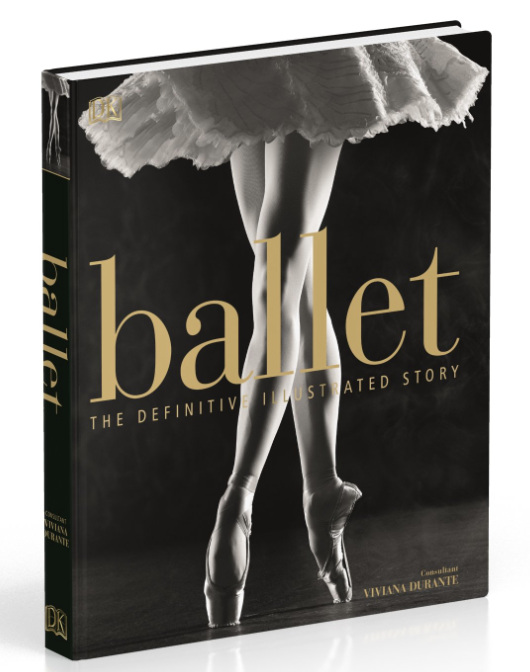 It’s no surprise that Ballet is a perfect gift or book for, well, ballet & dance lovers! And what better way to reach that audience than inside the famous ballet performance halls that are featured in the book itself? 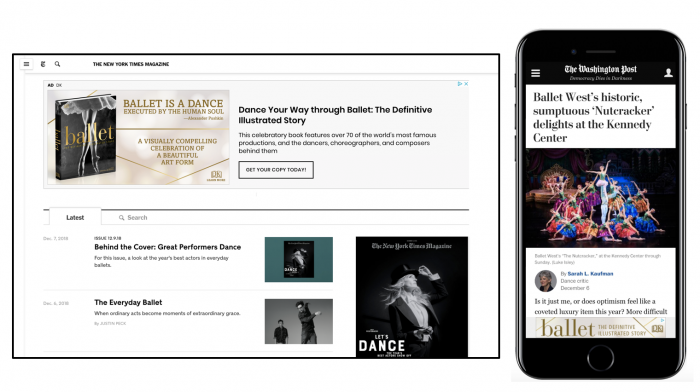 Using our proximity ads, we served the ads to people currently in or who have frequently visited professional ballet schools like Juilliard School of Dance and the School of American Ballet, as well as top theaters including American Ballet Theater, the New York City Ballet, and the Lincoln Center for the Performing Arts! We even reached dance teachers, students, and the parents of little ballerinas at local ballet schools and dance studios across the country. The native and banner mix targeted top traits like ballet enthusiasts, Nutcracker and the Four Realms fans, and, using our parallel genre targeting, those with a strong interest in similar books like The Art of Movement by Ken Browar and Life in Motion: An Unlikely Ballerina by Misty Copeland. This multi-prong approach of proximity, native and banner ads was perfect for mass awareness and engagement! The campaign finished with a strong .18% CTR for banners and native, and .22% CTR for proximity, and ran on top-tier sites and apps including W Magazine, NY Times, Vanity Fair, Allure, Bustle, Smithsonian, Washington Post, The Guardian, and more! Not surprisingly, the best performing audience included those who recently attended ballet performances (.21% CTR), Musicians and Dancers (.25% CTR), and those with a strong interest in the Performing Arts (.24% CTR). And while it did perform strongly with performing art enthusiasts, we were surprised to see that it was not resonating well with those people specifically interested in broadway and musicals. So, we optimized the impressions heavily towards the better performing elements like dancers and those who attend ballet performances. We love seeing what works best and using that to drive up engagement! 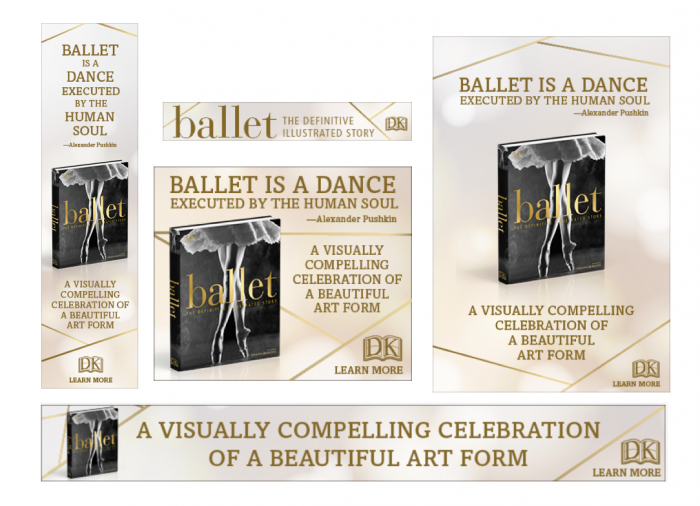 If you or someone in your life is a ballet enthusiast, you’re going to want to get your hands on Ballet! You can order your copy here. Stay tuned for part 2: Flora! 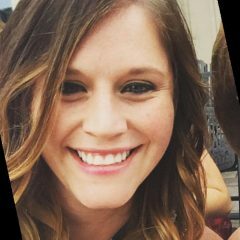 Looking to reach a unique audience? You know where to find me –> marybeth@adbiblio.com!